Farm cottages overlooking a vegetable garden. Resident ducks at Babylonstoren farm. Inside the wine tasting room. Yet it already has a reputation that’s spreading far and fast for effortlessly mixing old and new, local and foreign influences in everything from the garden design to the decor and food. Liesl Hattingh books in. Babylonstoren farm hotel has just won yet another accolade: South African design bible Visi’s interiors category. Before that it was the food category in Tatler magazine’s Best Hotels for 2012. Not a bad start for a new hotel on a 17th century farm. More importantly, though, a good friend who is also a stylist and lover of beautiful food has been urging me to visit – even just for a day – but until now a clutch of deadlines and preparations for a pending birth have taken priority. When I finally get the chance, expectations are high. 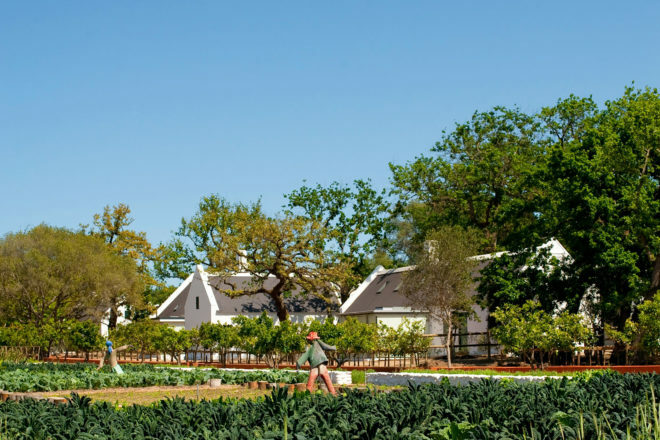 At around 10am I pull the pickup in next to a flat, sporty number and join a group of overnight and day visitors for the hour-long tour of Babylonstoren’s gardens, set in the Drakenstein Valley between Franschhoek and Paarl, an easy 60km east of Cape Town. 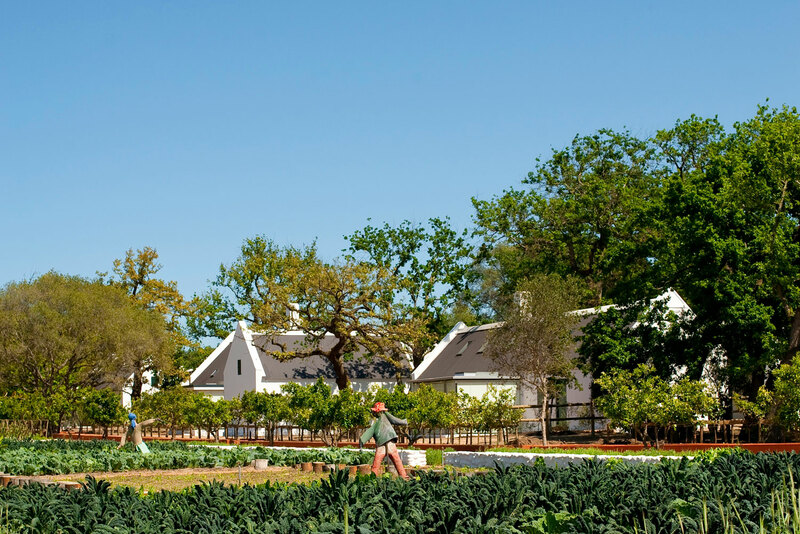 Throughout, glimpses of the various buildings scattered around the farm are visible, all based on the simple Cape Dutch style typical of a historic farm in these parts. It’s only when you remember that this is a luxurious, top-end establishment that you do a second (appreciative) take of the quirky details that make Babylonstoren so comfortable, authentic and true. Instead of the stiff, formal ambience of both the classic traditional and trendy contemporary country estates popular in this stretch of South Africa, I find collections of pumpkins, wellingtons, straw hats, local preserves and cordials, a swimming pool in the form of a converted reservoir (complete with inflated tractor tubes), and fresh vegies and country lifestyle books for sale in the farm shop, which also houses the reception behind a weathered desk. The garden is undoubtedly the heart of the farm hotel. Its produce is evident in everything from the bowls of seasonal satsumas begging to be eaten around every corner, to the restaurant menu, to the box of freshly picked vegetables in the cottage kitchen and the tussie-mussie – a bouquet of fresh herbs provided instead of bath salts. This sprawling edifice to nature is the size of two rugby fields (about 10,000m2), was inspired by the mythical gardens of Babylon and the original Company Gardens in Cape Town that supplied fresh produce to traders along the Spice Routs between The Netherlands and East, marking the first European settlement in South Africa. The intricately planted organic garden was laid out by French landscape architect and writer Patrice Taravella and is meticulously maintained by a squad of 20 full-time gardeners, plus various experts and occasional contractors. The variety is astounding, with more than 350 edible, medicinal or in some way useful varietals from all over the world: everything from dragon’s tongue bush beans to tomatillos; West Indian lime to black kale; even millet from Zimbabwe that an inspired security guard brought back from a recent trip home. The latter has been planted amid a flock of high-rise birdhouses next to a 150-year-old mulberry tree, and a couple of man-sized woven hides nestled in the bamboo – the perfect temporary nest for a city escapee. My six-year-old daughter gets stuck at the raspberry trellises, refusing to budge until she’s cleaned up the tail end of the harvest. Nobody minds; this is a place that encourages immersion. In a corner of the garden shaded by oaks is a recently opened teahouse set in a metal-frame glasshouse, parts of which were imported from France and whose airy good looks were key to the Visi award for interior design. The menu includes a choice of herb teas – freshly picked, of course – sharing space with an excellent yet unpretentious boerewors (farmer’s sausage) in a bread roll (home baked from stone-ground flour and not your average school fête fare) with wholesome tomato relish, among other light snacks. It’s a perfect place for whiling away the time, but there are many places to explore. My husband arrives and takes one of the mountain bikes provided for a spin and to see the farm dam, where canoes can be briefly purloined from the boatshed. I enjoy a close inspection of the cottage. Throughout the hotel, the style is comfortably blurred between the oldest of old and newest of new. Here, former magazine editor and South African style icon Karen Roos’ sure hand mixes pioneer style with Philippe Starck in the décor, while the selection of books in both Afrikaans and English across an impressive array of topics was perhaps influenced by Roos’ husband, a local media mogul. The result is a place that wears its heritage proudly but lightly, with many references to nature, history and contemporary international style. That translates into a lot of white, light or painted wood, a modern stainless steel feel in the kitchen, fully walled mirror in the bathrooms, new takes on classic furniture designs and art from around the world. The overall feel is wonderfully comfortable, and far removed from a typical hotel room. There’s time for a quick visit to the wine tasting room. The farm has always produced fruit, including grapes, but the cellar was only taken into use in January 2011 and the tasting room has only been open for a fortnight. It offers free tasters of Babylonstoren’s own first vintages: 2011 and 2012 Viognier, Rosé, Shiraz and Chenin Blanc, a 2012 Chardonnay, plus a carefully compiled choice of other local offerings. You can stock up too on local charcuterie, dairy and bread. More wine then and snacks from the cottage kitchen for the impromptu pétanque game where it doesn’t even matter that one ball is missing. The spa looks tempting, but will have to wait for next time. Too soon, really, dinnertime arrives. There’s the option to arrange babysitting, but the easygoing atmosphere (including no dress code) assures us we’re in for a treat, kid and all. The restaurant, Babel, is a creative conversion of an old cattle shed, complete with the oversized image of a bull looming large from the white-tiled wall that doubles as a blackboard. The dinner menu is short and changed often to allow chef Simone Rossouw to focus on freshness, seasonality, colour, texture and flavour. Nothing is quite as you expect, yet it’s a thrill to pick out a few of the goodies spotted in the garden earlier that day. The entrée salad is spiced up with rose petals and pomegranate seeds, while the starter is a pear affair infused with a multitude of tastes. There’s a choice of mains: lamb chops, local smoked trout and vegetarian options. Both meat dishes are interestingly prepared and presented with the day’s vegetables: celeriac with goat’s cheese and pumpkin with Satsuma. Dessert is a choice between a cheese platter and bruleéd Satsuma with homemade malva ice-cream. No matter how good, it’s too much for us to finish. While most of the buildings around the farmyard are carefully and imaginatively restored originals, the one- and two-bedroom cottages were built prior to the hotel opening in 2010. The style is timeless though and the advantage is that the cottages are substantially more spacious than the traditional restored labourers’ homes found elsewhere in South Africa. Ours was a two-bedroom, two-bathroom leading off an open-plan lounge and very contemporary glass box that houses the eat-in kitchen. There’s a choice of good local wines, espresso machine and Dilmah teas along with a bowl of Satsumas and a box of crunchy vegies. The bathrooms come complete with kikois to wear around the pool, double basins, a deep free-standing bath, a shower with two showerheads and gorgeous L’Occitane products in Verbena. Autumn is rearing its head, so the only thing missing are the slippers. The bed more than makes up for it though: simply styled in multiple white layers. Everywhere, it’s the small details that catch the eye. The only in-room disappointment is the sofa. The very stylish but sadly somewhat uncomfortable couch does not invite lounging in front of the home fire back at the cottage. Instead, we’re off to that sumptuously soft cloud bed until morning, when we can return to Babel to say our goodbyes in an appropriate manner: by polishing off plates of sunny, homegrown goodness. At Babylonstoren, everything is as it should be. We paid $740 for a two-bedroom cottage for one night, with breakfast included. The low-season rate is $517. There are also one-bedroom cottages, and the restored manor house is occasionally available for bookings. The farm is about 60km east of Cape Town in the heart of historic wine country. Check details of garden tours and wine tasting. Babel is open Wed-Sun, 12pm to 4pm, plus dinner Fri and Sat from 6.30pm at $37 per head with kids $18. The glass house is open Wed-Sun 10am to 4pm.